Road Less Travelled: Leh! A Paradise Hidden Among Mountains. Leh, the ultimate biker destination, an age old pit- stop for trade routes in the hills of Northern India has been the Mecca for bikers and adventurers. The city of Leh has now more bikes than people. A perfect destination that has grown very rapidly all thanks to adventure tourism. Leh has been on the wishlist for the past 6 years and finally the dream was fulfilled after much hiccups. After I crossed over Kashmir Valley, Reshma joined me in Leh to continue the road trip. 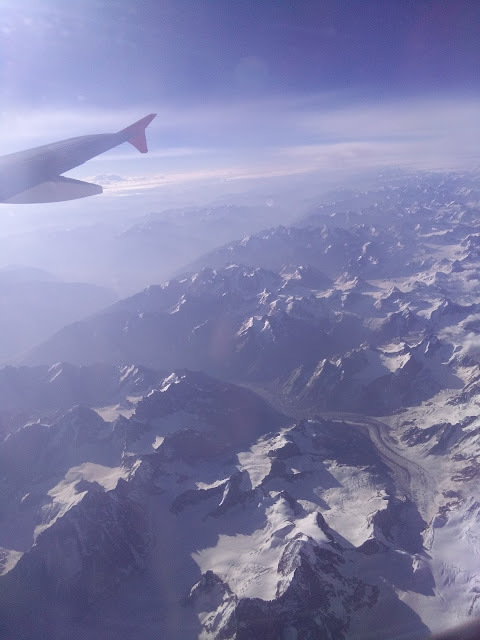 The first sight of Leh landscape from the window of a plane was splendid. The barren land with beautiful roads curving through mountains with glacier peaks and it was at that moment that it felt like the trip was totally worth it. The Land of Leh has never failed to disappoint. The natural beauty around and the Himalayas is an altogether a different experience. No wonder Himalayas is considered synonymous to meditation, nirvana, salvation. We were relaxed, our worries slowly faded away and all that remained was calmness and a smile on our face that refused to leave. After reaching Leh, we decided to relax for a couple of days to get acclimatized and not exert ourselves. We started our Leh sightseeing with Hall of Fame. A war museum constructed and maintained by the Indian Army dedicated to real life heroes who scarified their lives guarding the Nation. It has an amazing collection of weaponry and also on display are Pakistani weapons that were captured during war. There are several exhibits on display that are in use by men and women of the Armed forces. A section dedicated to the hardships that the Army men went through at the time of Kargil war and how they succeeded plus the emotional letters to their family members on display moved us to tears. A deep sense of respect, gratitude and pride filled our hearts. Right behind the museum is the War memorial dedicated to those who laid down their lives for Ladakh in 1947. Though there are many Shanti Stupas across the World, the one at Leh was the most enchanting one that we visited. It was a surreal experience to walk around the stupa and appreciate the paintings and carvings. If you like to meditate the meditation hall with the massive Buddha sculpture is just the perfect place. From the stupa a very interesting site caught our attention. There were several smaller stupas built on barren land. We were very curious to know it's significance and a kind local told us that earlier at this place Capital Punishment was carried out. To ask for forgiveness for the sin committed, stupas were built with each stupa signifying one execution. We spent hours looking at majestic Leh town and views of Tsemo Gompa and Leh Palace on the opposite hillock. With stunning vies of snowy peaks, we truly found Shanti at Shanti Stupa! With the cold evening wind settling in, we watched the sun setting behind the brown muddy mountains enjoying a bowl of hot maggi and Tibetan herbal tea at Shanti Stupa Cafe. Post sunset, the city was beautifully lit up and so was the Stupa and we could clearly see the runway of Leh airport from the Stupa. There were barely anyone at the stupa and we soaked in the beauty of this Japanese monument seeing it change colors. From our experience, we found it very safe to be at the stupa post sunset. If you love to trek you can skip the road and opt to climb steep steps on a beautiful mountain to reach the stupa. The tiring hike to the gorgeous Shanti stupa is quite a daunting task. A good test of one's stamina given the high altitude and dwindling oxygen level but the experience and views of Leh are totally rewarding and nice. 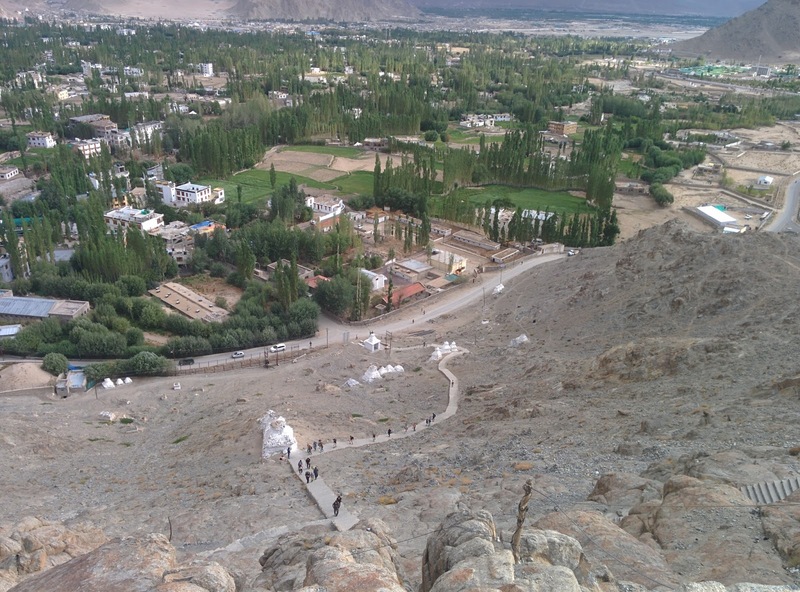 The steep hike could be quite easily done with a few breaks enjoying the stunning views of snowy peaks, Tsemo gompa, Leh palace and beautiful green Leh city. After the hike it would be a good experience to spend at-least few minutes in the meditation hall. In the evenings the monks recite prayers and play traditional music instruments creating a calm and soothing atmosphere to meditate and clear your thoughts. It is such an amazing feel even if you are not into meditation. Evenings are best time to hike up as the weather is kinder and you could watch another magical sunset. There are several adjoining hillocks that are easy to moderate treks and offer stunning views of Shanti Stupa. 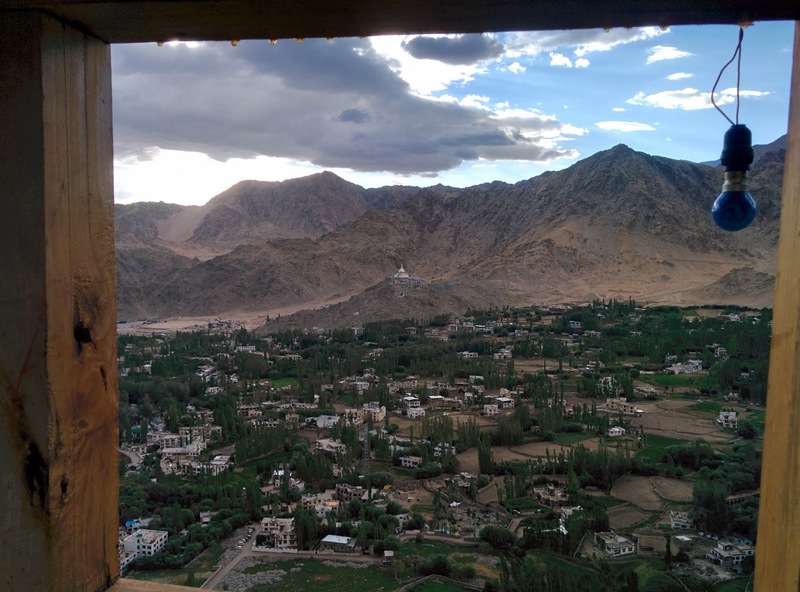 Though Leh has become very popular there are still a few amazing and stunning attractions that are well within the city and see fewer to absolutely no tourists. One such magnificent place, very close to Shanti Stupa, is "Tisseru Gompa," one of the oldest and biggest in Ladakh. The Stupa is believed to be 600 years old and the name Tisseru is derived from two words Teu and gseru meaning yellow mule in Ladakhi. According to the traditional legend a big yellow mule shaped rock existed in the present location and was haunted by evil spirit bringing harm to the inhabitants of the town. The king was advised to trap the evil force by building a stupa on the site. The existence of a rock beneath the Stupa has been corroborated during scientific study carried out by Archaeological Survey Of India (ASI). This mud and stone structure is one of the most stunning monuments in Leh with the architecture a blend of Indian Stupa and Tibetan shrine. Yet we were the sole visitors to this monumental site with neither an entry fee nor a gate keeper to protect the monument. A beautiful road from here took us to Tsemo Gompa- A castle like temple built atop one of the highest hills. This amazing Gompa again had very few visitors. Built by King Dakspa Bumdhe in 14th century, the Namgyal Tsemo Gompa got its name after Namgyal meaning victory which was attained by the kingdom after defeating Hor forces in war and Tsemo meaning at the top as the temple is situated at a mountain top. The stunning views of Leh city and Shanti Stupa plus the snowy ranges seem unreal. Plus the centuries old monument was such a charmer and the massive statue of Mayetra Buddha towering three storeys in height was such a show stopper. The paintings in the monasteries are simply breathtaking and an age old ladder in very questionable condition is what took us three storeys above to the very top of the castle. It was an amazing experience to be right on top with incredible views of Nature and the beautiful Leh town. Before roads were introduced all monasteries, palaces and stupas were accessible only by trek and even today it is so nice to see all these trek paths alive and kicking. There is a trek path from Tisseru Chorten to Tsemo Gompa and from there to Leh Palace. We took the road to this centuries old Palace. Leh Palace is a legacy of Ladakhis' war with Kashmiri rulers in the 19th century. Stones, mud bricks and Poplar wood was used in the construction of the Palace. The insides of the Palace is more like a maze, the massive 9 storey palace again offers stunning views and is a perfect place to watch sunset. Shanti Stupa, Chorten, Tsemo Gompa and Leh palace all are very close to one another and can be clubbed for one fine evening. Zorawar Fort Museum an age old fort dedicated in memory of an able warrior Zorawar Singh. 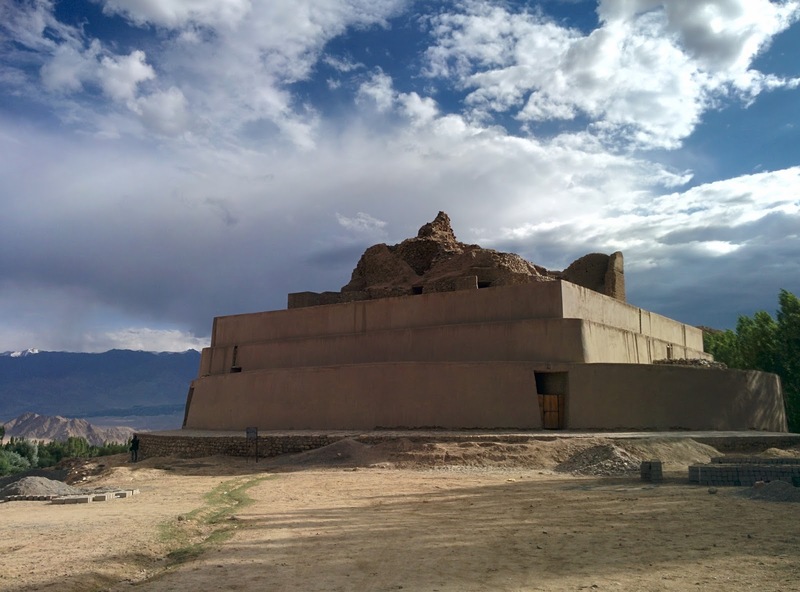 Not much of the fort remains today but for a very well kept museum that provides tons of historic information about J & K, Ladakh, the people and prominent personalities that shaped this part of India. There are very valuable and amazing artifacts in the museum. The fort is under the Indian Army jurisdiction. An interesting stop on Leh - Kargil highway is the Pathar Sahib Gurudwara. It is believed that a massive rock was rolled down by a demon to kill Guru Nanak while he was meditating but on impact the rock softened like warm wax and did not harm the meditating Guru. It is believed that the hollow block on the rock is the back of Guru Nanak. It is a highly revered place of worship. A lot of truck drivers stop by to pay their respect and pray for a safe journey in these unforgiving mountains. Like always no Gurudwara lets you walk out with out feeding you and Pathar Sahib treated us with biscuits, boondi and chai. En route is magnetic hill. Food is such an integral part of travel there are plenty of restaurants in Leh and we stumbled upon one of the finest in terms of ambiance, value for money, and most importantly lip smacking food. "Wonderland Restaurant and Coffee House" on Changspa Road. For the very first time, we tried tibetian veg thali that has Alu Phing Tse (mixed veg noodle,) fried spinach, a bowl of rice, amazing salad and one Tingmo (steamed dough.) The Tibetan thali tasted amazing. The mixed veg curry and spinach complimented rice very well and was a very wholesome meal. The spicy green salad gave an additional kick. It was quiet a refreshing experience to try local cuisine. 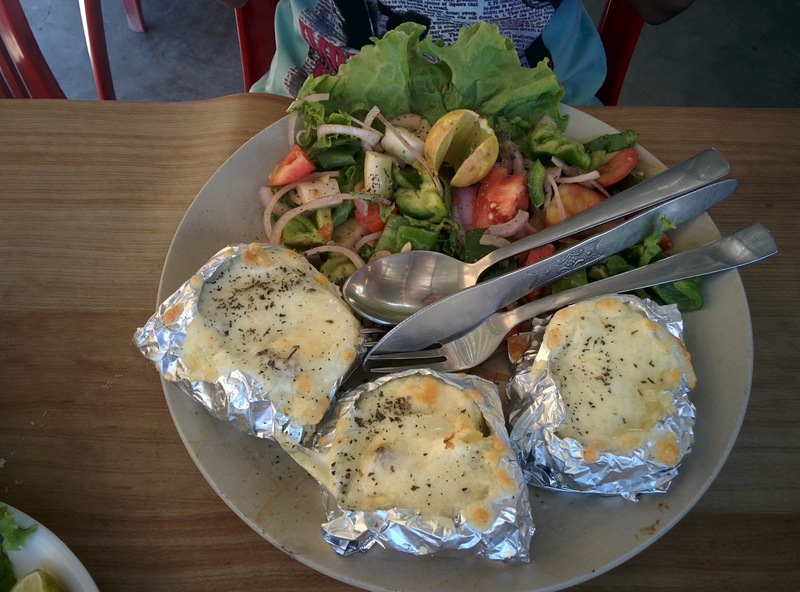 We had also ordered for mushroom cheese baked potato, it was exceptionally well done. The local cheese was one of the very best that we had tasted. Potato baked at perfect temperature and stuffed with good amount of mushroom and cheese garnished with local herbs melted in our mouth and was served with fresh and great quantity of salad. All neatly wrapped in aluminium foil made sure the food remained hot for longer time. Peach ice tea and fresh apricot juice that perfectly completed a hearty meal. We were already waiting to get back to this place for dinner. The Indian cuisine served here is pretty good. A very good meal for two costs around Rs.450. Time goes by very slow in Leh, neither the businesses nor the customers are in a rush. So contrary to the fast paced world back home. In several instances we saw travelers just sit by a cafe, sip flavored tea and be engrossed in a book. 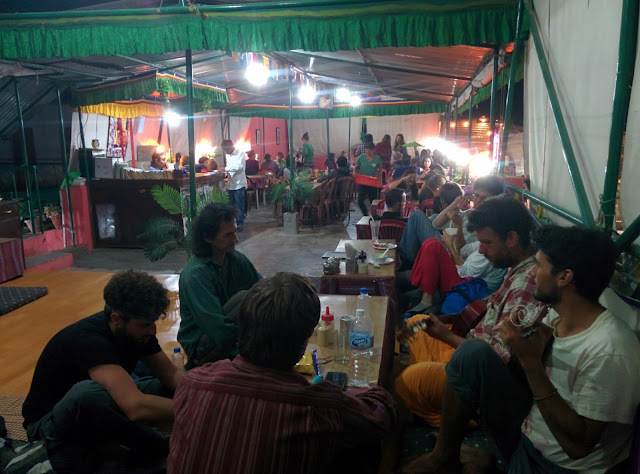 During one of our dinners, a group of young Israeli backpackers played soothing music and it was one of the best dinners we had in a long time. Not once did the people working in the restaurant or the owner gave dirty looks or ployed subtle ways to ask any of us to leave. Folks were engrossed in deep conversations and sat in restaurants for long time even after settling the bill. Most of the cafes and restaurants have books and board games to entertain their guests. It was such an awesome and beautiful feeling to have experienced this. Wonderland restaurant serves amazing and sinful pastries. Their mint tea is just out of the world. Among the many eat outs a jewel in Leh main market is 'Ramposh Shake Corner.' This shop serves amazing mango shake topped with one of the best softies. There is a cafe right next to the Hall Of Fame museum- "Aroma Cafe" that serves amazing quick bites and thirst quenchers. Iced lemon tea and cold chocolate shake are a must try and we loved their veg cheese pizza. The cafe also has books and board games to keep patrons engaged. It would be a great idea to sit out as right besides the Cafe is the Army's Airfield and we got to see several choppers and massive Indian Air force planes take off. 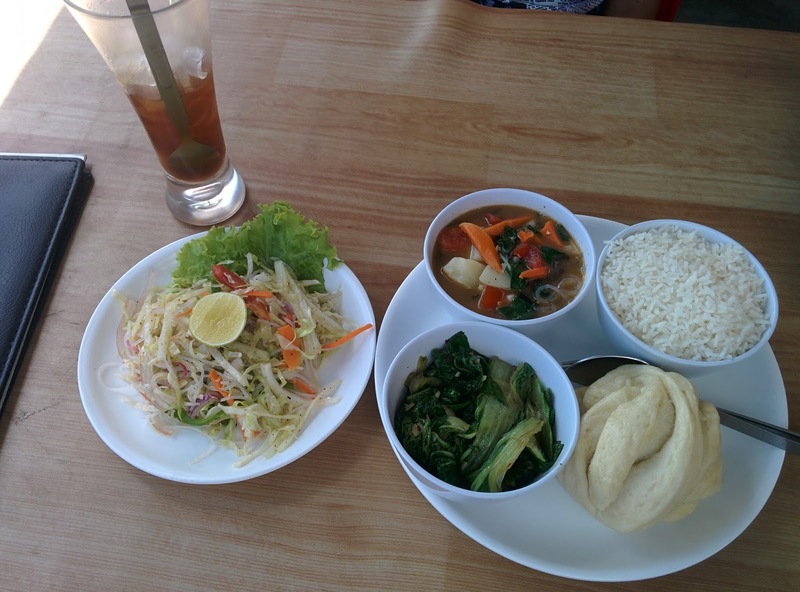 The cafe is very reasonably priced, a heavy lunch for the two of us costed us Rs.290. During our stay in Leh we checked into Hotel Omasila on Changspa Road. An amazing hotel, best part is that we had killer views of Shanti Stupa and the surrounding hills from our room. The room was loaded with all modern amenities and luxuries, super soft mattress and pillows with cozy quilts that would instantly put you to sleep. There service standard is par excellence. The complimentary breakfast was yummy. They have safe parking facility and the main Leh market is at walk-able distance. The sit out at the hotel was perfect, you can just sit there for hours close your eyes and soak in the beauty around. If this was not enough at night the view of the beautifully lit Shanti Stupa with millions of stars lit in the sky and the cold wind whistling in your ears makes the night even more romantic. It was just perfect in all ways. During our second stint in Leh, we ditched the comforts of a hotel and rather opted for a calm and quiet authentic Ladakhi home stay experience on the Shanti Stupa road- "Thang Thong home stay." We were introduced to this kind and amazing Ladakhi family of 4 running the home stay through awesome friends we made while travelling, a volunteering couple, travelling to Leh for three months teaching children. Their recommendation of this home stay added more charm to our already pleasant experience in Leh. This hidden treasure does not advertise their home-stay much, a fact we found amusing. At Rs.600 per night they let out amazing, comfortable and clean rooms with attached bath and solar powered running hot water. Like many Ladakhi families, they have an amazing organic farm that gives them almost all the vegetables they need. The host is an amazing cook and we digged into lip smacking chicken curry with rice, dal and vegetables for dinner. We ended our wholesome dinner with piping hot mint tea in their traditional poplar supported dining room. This home stay is right next to Shanti guest house. They offer safe parking facility and were kind enough to ask our preference and liking in food. Staying here, we felt pretty much at home. On the second day of our stay here, they served freshly made momos with garden fresh vegetables as stuffing and soup. Truly, nothing beats homemade food. Thanks for the kind words, Leh in indeed a treasure trove. I'm blown away with the beauty of the this places. Nice photos! Thanks, the destination looks even better in person, hope you visit soon.